@yankeeslose | American McCarver. Your Sports Blog. 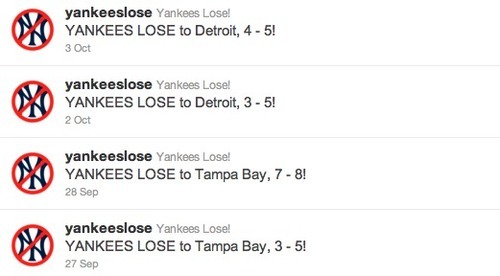 As long as we’re trotting out the passive-aggressive anti-Yankees software today, I should also mention @yankeeslose, a Twitter account that only posts when the world is filled with hope and joy.